It’s been forty years since we were first introduced to precociously psychotic murderer Michael Myers. The Shape’s slow, deliberate walk and deathly silence will haunt horror fans forever; with his quiet demeanour so much more frightening than if he had simply ran and raged. Now the poster for the upcoming remake of the 70s classic is here and – despite being deceptively simple – it is very, very effective. 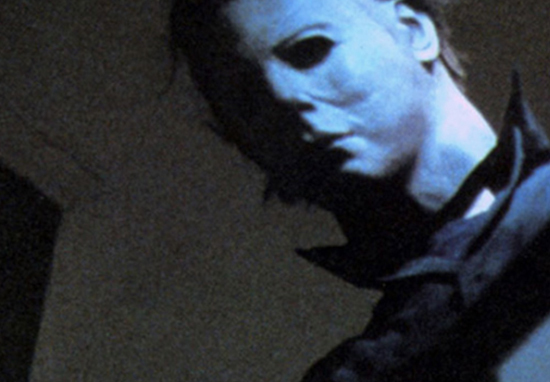 In a much longed for tweet from Blumhouse Productions, the poster finally reveals Myers’ latest gruesome mask. Heavily lined and criss-crossed with wrinkles, this new mask has already provoked excited discussion among fans. The features are warped and obscured with age, revealing thin lips, hooded eyes and a furrowed brow. We are looking at a much older, worn down Myers, although I’m willing to bet he isn’t planning a comfortable retirement full of Caribbean cruises and garden rockeries. Although this is the 11th in the mixed-bag franchise, this will be a fiercely loyal sequel to the much admired 1978 John Carpenter original. All other sequels will be ignored, neatly sweeping aside decades worth of somewhat clunky Haddonfield history. Including the fact protagonist Laurie Strode was – rather pointlessly – killed off in the critically reviled Halloween Resurrection. Fans are confident this new outing – directed by David Gordon Green – will restore the gory spirit of the original. Carpenter has given this revitalisation his expert seal of approval, stepping in to actively help with the project. Jamie Lee Curtis will reprise her role as resourceful Laurie Strode while the original and best Myers actor Nick Castle will be putting that infamous mask back on. I had a dream last night the 1st trailer for #halloween2018 dropped then I woke up and was sad………. They went full-tilt boogeyman. And I’ve never said that in my life, and I will say full-tilt boogeyman for the rest of the year as I go around talking about this. There was the idea of, ‘What do you call it?’ If I had had my druthers, I probably would’ve called it Halloween Retold. Because it’s being retold. It’s the original story in many, many, many ways. Just retold 40 years later with my granddaughter. You’d better rest up over summer because there might be some sleepless nights come autumn.